This next section of the website will summarise some of the current literature concerning the potential relationship between developmental outcomes and dietary patterns in human research. 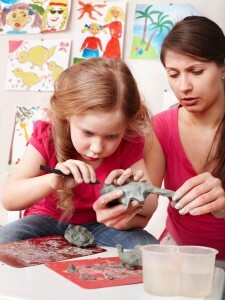 The focus is on the role of omega-3 fatty acids in learning, behavior and mood. It will also briefly discuss findings from cross-sectional longitudinal studies and randomised, placebo-controlled, double-blind trials in children. Professor John Stein from Oxford University has previously hypothesized that DHA insufficiency in utero (during pregnancy) may be linked to impaired magnocellular neurite growth which are in turn implicated in reading disorders such as dyslexia. . Several, clinical trials have reported statistically significant improvements in reading, spelling and behaviour following supplementation with omega-3 fats compared to placebo [56-58]. However, the data have been criticized as somewhat inconsistent and fragmentary. Potential reasons for this are proposed in later sections of the website but replication is warranted in larger, clinical trials which have been adequately powered. Above image (click to see full size) Means and 95% CI of the % of children with suboptimal outcomes (defined as the lowest quartile for the verbal IQ, fine motor skills, social skills and prosocial behaviour). The Avon Longitudinal Study of Parents and Children (ALSPAC) which is also known also as Children of the 90s is a long-term health research project with Bristol University. The project enrolled more than 14,000 mothers during pregnancy in 1991 and 1992, and the health and development of their children has been followed in great detail ever since. Dr. Hibbeln and colleagues using data from this study reported that maternal seafood intake during pregnancy of less than 340 g per week was associated with an increased risk of children being in the lowest quartile for verbal intelligence quotient (IQ) (no seafood consumption, odds ratio [OR] 1·48, 95% CI 1·16–1·90; some, 1·09, 0·92–1·29; overall trend, p=0·004), compared with mothers who consumed more than 340 g per week. Low maternal seafood intake was also associated with increased risk of suboptimum outcomes for prosocial behaviour, fine motor, communication, and social development scores. 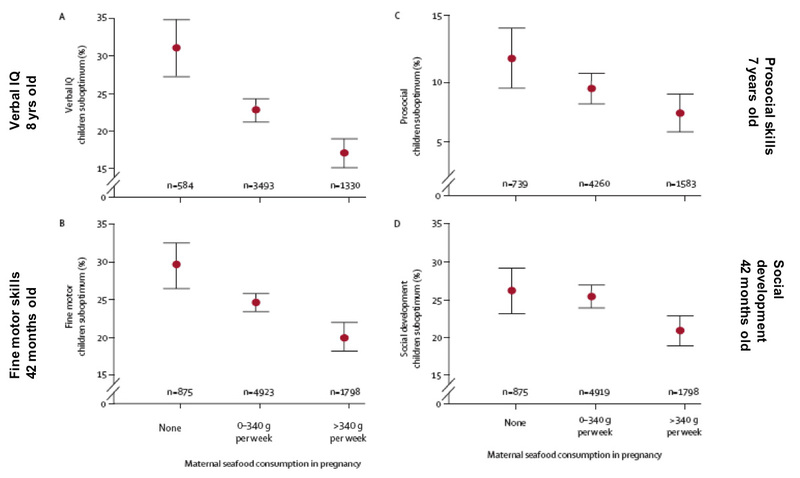 In other words, for each outcome measure, the lower the intake of seafood during pregnancy, the higher the risk of suboptimum developmental outcome . Essentially, this study suggested that the lower the seafood intake during pregnancy – the higher the risk for adverse developmental outcomes. Early dietary intervention with the omega-3 DHA and/or fish intake during pregnancy and breast-feeding has been associated with improved visual acuity  and an improved ability in problem solving . Consistent with these findings, maternal fish intake during pregnancy and the duration of breastfeeding are associated with improved early child developmental outcomes . Another study which examined associations between breastfeeding and IQ, reported that these factors were moderated by a genetic variant in FADS2, a gene involved in the genetic control of fatty acid pathways  . The authors of this study suggested that genes work via the environmental to modulate IQ and that the breastfed babies in their study may have higher IQ points due to the fatty acid content of their mothers’ breast milk. The Raine Study  was another longitudinal study conducted in Australia. In this study, the researchers followed 2,868 live births to age 14 and then assessed the adolescents for dietary patterns and an ADHD diagnosis. Data were available for 1,799 adolescents, of which 115 had a diagnosis of ADHD. The two main dietary patterns were assessed and categorized as “Healthy” and “Western.” The results found that the “Western” dietary pattern was positively correlated with higher intakes of total and saturated fat, salt, and refined sugars and was inversely correlated with an intake of folate, fiber and omega-3 fatty acids . In contrast, the “Healthy” dietary pattern was positively correlated with fiber, folate, and omega-3 fatty acid intake and inversely correlated with the amount of refined sugars and the total fat/saturated fat ratio . The results reported that an increased likelihood of an ADHD diagnosis was significantly associated with the Western dietary pattern, after adjustment for potential confounding variables from pregnancy to adolescence. The ADHD diagnosis was not found to be associated with the Healthy dietary pattern. Clearly, firm conclusions cannot be drawn regarding the causal nature of dietary patterns on the likelihood of an ADHD diagnosis because of the cross-sectional nature of the study design. The observations may also be bidirectional. In others words, the diagnosis of ADHD may be either indicative of poorer food choices or the Western diet may have promoted the expression of attention deficits. The results of this study do however highlight the necessity for a closer inspection of the role of dietary patterns in children with ADHD . There are a handful of studies reporting low levels of omega-3 HUFAs in both plasma and red blood cells of children and young adults with ADHD compared to controls [60-63] The reasons for this however remain unclear and further investigations are needed to establish whether these differences simply reflect a shortfall in dietary intake or a potential metabolic abnormality. There has been some unproven speculation that the activity of the delta 5 and delta 6 desaturase genes whose enzyme activity is necessary for the synthesis of HUFAs, may be impaired in ADHD but this would need confirming using a method such as stable isotope (which act as tracers and can map both the absorption and synthesis of fatty acids).